Have you seen the latest skin care trend? You know, the mask? I've noticed a lot of women on Instagram daring to show us their masked faces. Curiosity got the best of me and I thought I would request a press sample to see what all the hype was about. The kind guys at Farmacy sent me a Farmacy Beauty Hydrating Coconut Gel Mask and I was ready to see how this mask would help my delicate skin. 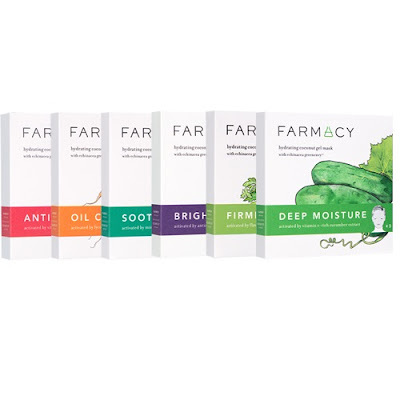 Introducing Farmacy Hydrating Coconut Gel Masks! Coconut gel provides intensive hydration and restores the skin’s balance. Next the bio-cellulose sheet releases its complex of components to provide the skin’s surface layers with a penetrating surge of active ingredients. The masks come in 6 specialized formulations:. 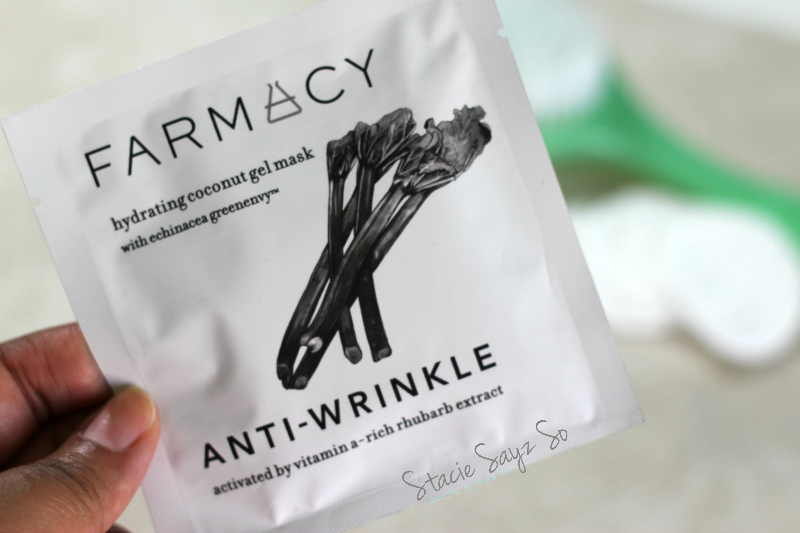 Remove the mask from the sachet and unfold completely. The mask is placed between two sheets of protective mesh. Remove one side. Now place the exposed mask side on your face and smooth over surface, then remove the other protective mesh. Leave the mask on for 20 - 25 minutes for the best results. 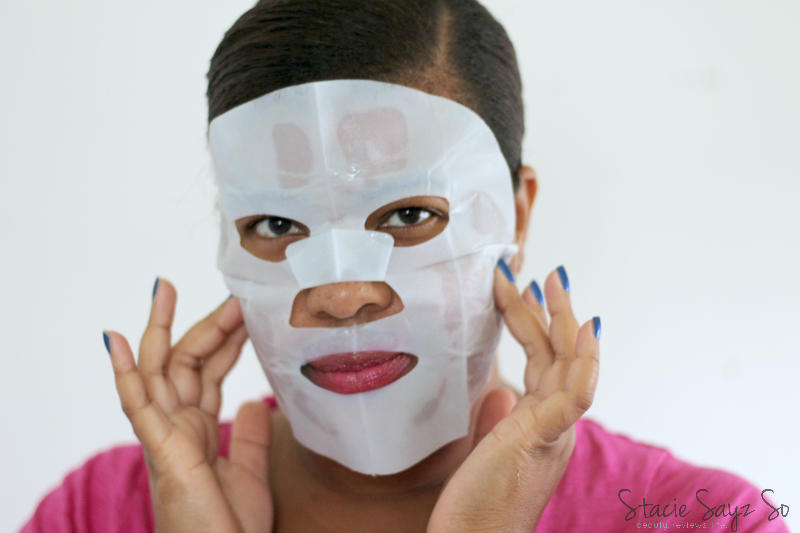 Remove the mask and gently massage excess formula into the skin. The mask itself was very slimy as I laid it on my face, which was to be expected I guess. It was a little cumbersome trying to fit it on. I couldn't keep a straight face. I felt like I looked like some masked wrestler! I laughed so hard as my son tried to take pictures of me. My husband retreated to his man cave. Ah, the things we do to be beautiful! I only kept the mask on for a little over 10 minutes since my skin is so sensitive. After I took the mask off, I gently rubbed the residue into my skin as directed. My face felt very dewy and moist, but I eventually rinsed it off as my skin started to feel a little irritated. Honestly, I'm on the fence with this one. I personally would only use this every once in a while because the mask just looks and feels awkward to me. My skin did feel very moisturized. I'd almost like it better if this were a product I could apply directly to my face. I know what you mean. It's fun to try new things, though. I love doing a full mask facials every few months because love how it feels once my pores are open. However, like you said, I don't want it to be a chore - it should be easy breezy and relaxing. I just had a lot of trouble keeping it from sliding off my face! I loved your review on this product. It does look a bit cumbersome! But that is great it did in deed moisturize well! Yes, there was lots of moisture to be had! I would like to try this considering my skin is also sensitive and its hard for me not to have a reaction to masks. Having sensitive skin is hard. You always have to be cautious about products. I keep seeing folks displaying this type of mask on Instagram. It made me look crazy!